Maharashtra Mega Bharti. 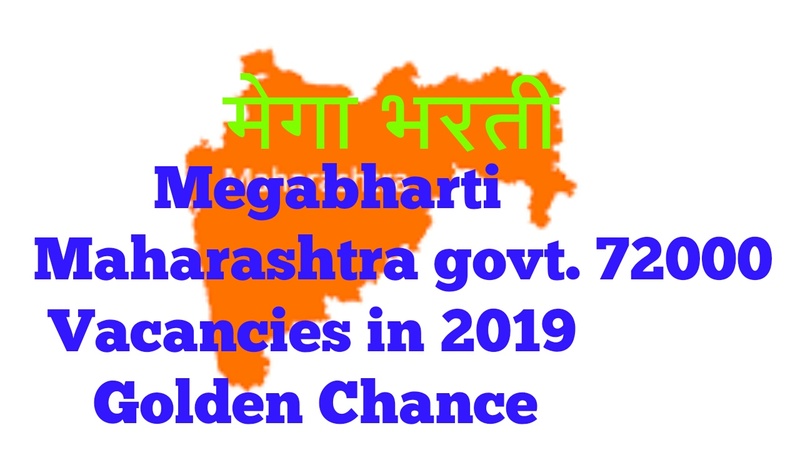 government led by chief minister Devendra Fadanvis announced Maharashtra Mega Bharti 72000 vacancies in two phase in 2019. In first phase it will be for 36000 vacancies in 2019. Recently Maratha reservation issue is solved with positive side. Now, It is certain that the recruitment process for these vacancies actually starts in 2019. The vacancies are filled mostly of group C & D post such as Talathi, Gramsevak, Police Bharti, Arogya Sevak etc. It is well known in Maharashtra that in last 4 years government hasn’t recruited government vacancies in Maharashtra. Maybe it will be strategy to win election in 2019 by announcing Mega Bharti. Mega Bharti recruitment will be taken online way by Mahapariksha Portal for that GR is announced by Maharashtra government regarding this. So it is certain that 2019 will be Golden Chance for Maharashtra domacile candidates to grab the opportunity.